Darren’s talk yesterday on How to Prioritize Your Local Search Work was the most practical I’ve seen. It was a peak among peaks at Distilled’s SearchLove conference. Local SEO is filled with hocus pocus. Even when people do work on important stuff, they often neglect some of the basics. That’s because their priorities aren’t clear. 1. All the good advice that didn’t make the cut because it wasn’t must-do stuff. Darren wanted to talk even more about reviews – which he cited as the highest-payoff part of local SEO (and I agree with that). 2. How highly he recommends GetFiveStars and Moz Local. 3. Darren gave a nice shout-out to Yext – in the context of it being handy for enterprise-level SEO. 4. The handy cheat-sheet – which is easy to miss (on slide 90 of 99). 5. How many questions Darren got during the Q&A and during breaks. 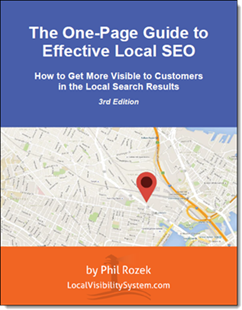 Local search is a pain-point for so many business owners, marketers, and SEOs. What did you take away from the slides? What are your local SEO “priorities”? Great slide show and an excellent overview of how to do the fundamentals of local search. I just wish these slide shows had audio:) As to what my priorities are when working with clients…I need to work on the whole Yelp thing. I’ve got my clients on Yelp but I need to push them harder to give their Yelp profiles more exposure to their customers. Thanks for stopping by, Travis. Yelp is tricky, all right. If you are a DistilledU member, you get access to these videos… after a while. Yeah. You also get them if you go to the event and buy the “video bundle” (as I did), or you can buy them a la carte. Phil–his point about getting at least one superlink. Are you in agreement that a single high authority link has substantial value? I agree with that. In most markets you don’t need any links to read well, in my experience. But in competitive ones, it’s quality over quantity. Thanks Phil. And a super link is what…Moz Domain rank of at least 70? Or even higher? Just depends. But I’ll defer to Darren on that one.